I have arrived in Shetland to finish of the LK243 UnderSail residency, and have just collected 5 SEA POSTCARDS from Shetland Arts office. Exciting! 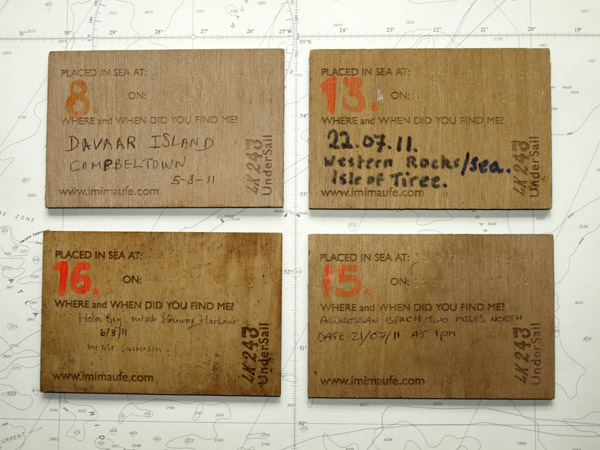 43 SEA POSTCARDS were placed in the sea between Waterford, Ireland and Halmstad, Sweden and numbers 5, 8, 13, 15, 16 have been found between Fleetwood, Lancashire and Stornoway, Isle of Lewis. If you do find a SEA POSTCARD feel free to write your contact details on the back so I can get in touch with you. Keep looking there are 38 still to be found! The documentation resulting in this dispersal and collection of SEA POSTCARDS will form part of the LK243 UnderSail exhibition that is planned to travel back to some of the destinations that the Tall Ships Race 2011 visited next year: more info later. Look in the Residency Section on right for more info and images.